Surprise Ingredient - you need to scroll through recipe!! Add the minced garlic at the end so it doesn't get burned but cooks enough to get aromatic and soft. While the onions are caramelizing, soak the roll in the milk until is is mushy and breaks into pieces. Mix the meat, eggs, salt, pepper, parsley, grated cheese and soaked roll together until well blended. And the add the caramelized onion and garlic mixture. This is truly what makes this meatloaf so good!! Put 2 Tbsp olive oil in your baking dish and place in your preheated oven to heat the oil. Once the oil is hot, form the bottom layer of your meatloaf in the heated oil and add sliced CHEDDAR CHEESE before you put your top layer on. Pour your pureed tomato sauce over the top and bake for about an hour until bubbling and slightly browned on top. Serve with roasted regular and sweet potatoes or mashed and sauteed spinach. In our family meatloaf is basically a giant meatball baked in the oven with a surprise in the middle. The surprise that my Nana put in the middle were a couple of hard-boiled eggs. This remains a great mystery to me. As a kid, I would surgically remove the hard boiled eggs. I found them completely unnecessary and their texture and taste not quite right. I am BUMMED for never asking my Nana why she added the eggs. And my Mom doesn't really know why, she just knows "that's how it was done!" Not quite the anwer I was expecting. So, I have eliminated the eggs but added my own surprise. 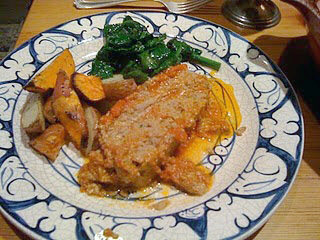 Other than that, this is our meatloaf recipe. Tips and Substitutions: If you can find chopped veal and pork, just use beef and put 2 strips of bacon on top for that extra flavor.